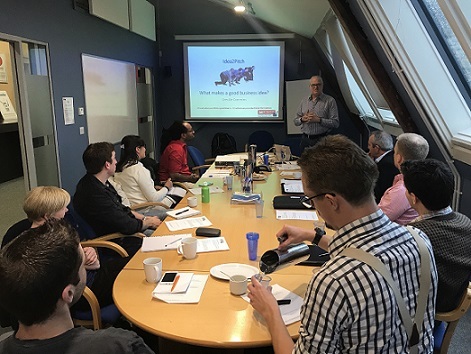 SETsquared Bristol’s successful #Idea2Pitch event returns on 24th April 2018, providing businesses with support and advice through a workshop to help hone their ideas and sharpen up their business pitches. Whether you’re an established company needing advice on how to grow, a start-up in the early stages of development, or struggling to get your idea off the ground, #Idea2Pitch aims to help those in the high-tech sector find their way, and offers companies the opportunity to informally meet mentors, experts, and peers in the start-up community. The bi-annual event has gained high interest thanks to the excellent mentoring/teaching that start-ups gain. We launched #Idea2Pitch in 2016 after identifying a lack of support for start-up businesses in the high-tech sector who needed to refine their ideas and improve communication with their target audiences. Following the success of the past three #Idea2Pitch events, we’re pleased to offer even more local businesses the opportunity to gain expert feedback on their ideas and pitches. Multimedia publisher, VIKA Books, joined the incubator as a virtual member after attending one of the first #Idea2Pitch events. VIKA Books founder Victoria Forrest was able to “define the essence of the business” through support provided at #Idea2Pitch, which ultimately gave her the reassurance and confidence in her company to successfully apply for SETsquared membership. The South West has recently been identified by the Government as a potential start-up hub for the UK, and statistically, start-ups in Bristol have the highest survival rate in the region. SETsquared Bristol aims to keep this success rate up, and is currently supporting over 85 companies through its high-tech incubator. Well-polished ideas and strong pitches are key to acquiring the investors, clients, and partnerships needed to make businesses flourish, and #Idea2Pitch offers this support in an informal workshop setting. #Idea2Pitch will take place at the Bristol SETsquared Centre at Engine Shed from 2pm to 6pm, and kicks off with a talk from SETsquared Entrepreneur-in-Residence, Greville Commins, on what makes a good business idea, followed by an interactive workshop on developing a pitch. Attendees will get the chance to practise their pitches towards the end of the workshop, which will be followed by a SETsquared Bristol tour and Connect networking event, where new pitches can be put into action! In partnership with Techstars Start-Up Weekend, two guaranteed places at #Idea2Pitch, plus two one-hour follow up sessions with Entrepreneur-in-Residence Greville Commins will be awarded to the winners of Start-Up Weekend’s pitching event. If you’re interested in attending #Idea2Pitch on 24th April, and gaining expert insight and advice into your pitch, apply to attend here. If you’re wondering whether your tech company is ready to apply to an incubator, read SETsquared Bristol Centre Director Emma Thorn’s blog on the subject here.